MOSCOW, November 19. /TASS/. The first Russian humanoid robot will travel to the International Space Station (ISS) aboard a manned Soyuz spacecraft, Chief Designer, First Deputy CEO of Energia Space Rocket Corporation Yevgeny Mikrin said on Monday. "Under the project called Tester, an autonomous robot will be created. It will perform work inside a promising manned spacecraft, inside the Russian segment of the ISS. 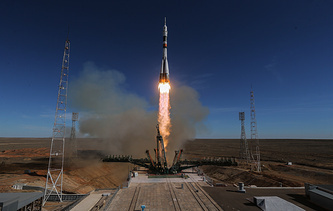 The first copy [of the robot] will fly aboard a Soyuz spacecraft," Mikrin said at an international conference devoted to the 20th anniversary of the world’s sole orbiter. The chief designer did not specify, however, the timeframe of launching the humanoid robot to the orbital outpost. According to the presentation of the Energia Space Rocket Corporation, there are plans to create two more robots. The former, Cosmorobot, will work with the research and energy module expected to be launched to the ISS in 2022. The latter, Teledroid, is designed for work on the space station’s Russian segment.